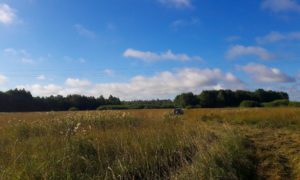 First time in the West, Gangteng Tulku will establish a retreat center for his students in Europe and elsewhere in a small village of Umbusi in the middle of Estonia. If everything goes as planned, the first batch of retreatants will start in 2021 (follow the updates on our website). The retreat center will consist of a facility focused on 3-year retreat, as well as individual retreat huts for shorter retreats. 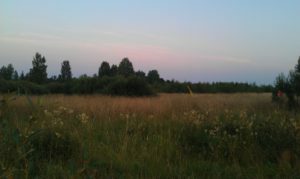 Gangteng Tulku has instructed Sanghas to focus on building the first center of this kind in Estonia, followed by several others in Europe. 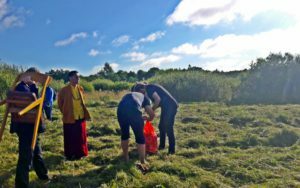 Here, Gangteng Rinpoche is on his way to the location of the future retreat center through the fields to perform purificatory rites. 2017. 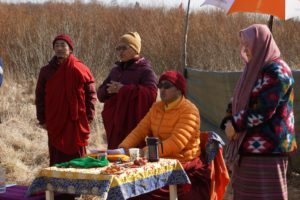 Sungtrul Rinpoche performing the earth ritual (sa lang) in April 2018. Khenpo Karma Wangyel was coordinating all the practical aspects of the ritual.